Andy Milne, piano/composer;/poet; Aaron Kruziki, soprano saxophone/clarinet/bass clarinet/douduk; John Moon, spoken word vocals; Christopher Tordini, acoustic & electric bass; Kenny Grohowski, drums; FEATURED GUESTS: Ben Monder, guitar; Ralph Alessi, trumpet; La Tanya Hall, vocals/spoken word; Michael Attias, alto & baritone saxophone; Christopher Hoffman & Jody Redhage, cello. From the cover of this compact disc, it would appear that the creator of this music loves dogs. There are several pedigrees pictured. Yet the album is titled “The Seasons of Being.” Hmmm. That’s a teaser for my brain. I’m anxious to listen. On the opening tune, dancing atop a piano background, a female voice tells me this is an “ …Exploration into psycho dynamic forces … changing brain waves … healing”. Then a male voice enters, accompanied by bass and drums. He tells me that “Each of us is made of flesh and bones/ hearts and minds/customized by our environment.” The voice explains, “ … music has the power … a blueprint that acknowledges and incorporates our emotional character.” Andy Milne’s poetry pulls at your mind, while a double bass solo soars over the repetitive background track. The pianist, poet and composer here is Milne. He strives to incorporate ‘spoken word’ with modern jazz, applying the principles of homeopathic healing and improvisation to interpret his “Dapp Theory Ensemble”. The result is fresh and creatively inviting. During a life crisis, where Andy was fighting Prostate Cancer, he sought to better understand homeopathic healing. His study of that subject led him to a project he calls, Chamber Music America. This project is meant to broaden the range of musical expression for not only the participating musicians, but to stimulate the listener and perhaps even become a catalyst for healing. 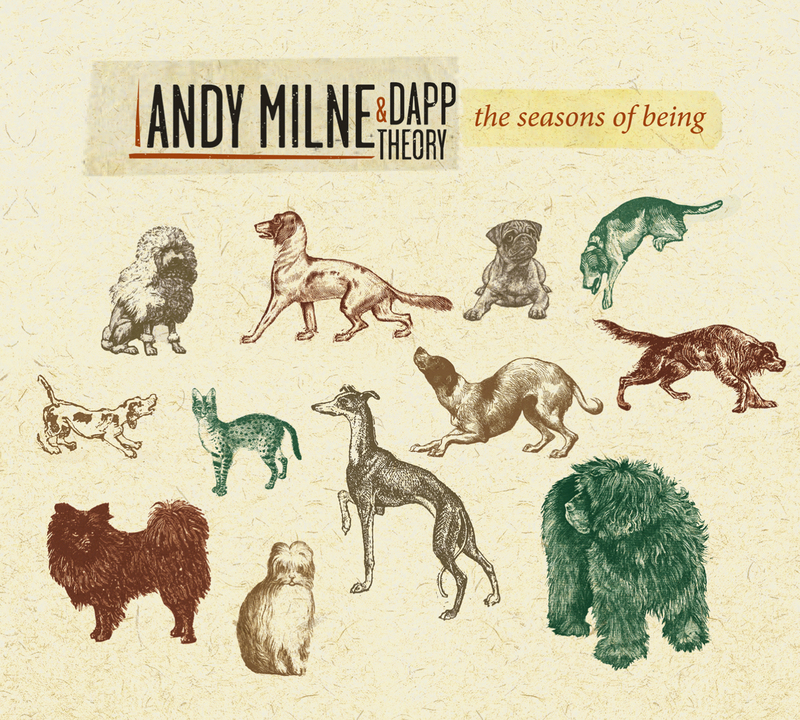 As a professor at the University of Michigan, Andy Milne and his Dapp Theory ensemble endeavor to stretch the boundaries of modern jazz and mix the music in such a way that it not only entertains, but also informs the listener. Perhaps music infuses the cells of the body and not just the ear-ways. On track three, “The Guardian” features the sweet, soprano vocals of La Tanya Hall, who sings a very difficult melody of unexpected and challenging intervals. She is also the voice that transmits some of Milne’s prose throughout this recording. Jody Redhage’s cello work on this song is a lovely addition to the arrangement. Aaron Kruziki’s soprano saxophone is stunning and takes flight on the fade of this song in a beautiful way. John Moon is another ‘spoken word-smith.’ He adds Andy Milne’s rap-like flavor on the “Scotopia” tune. We hear Andy Milne’s piano solo on this ‘cut,’demanding our attention in an enchanting and sugar-sweet way. Ralph Alessi’s trumpet slaps the jazz into place, merging from solo to unity with the saxophonist. Kenny Grohowski’s fluid and powerful drum licks demand to be acknowledged and he holds the rhythm firmly in place. On the original composition, “Three-Way Mirror,” Christopher Hoffman bows an impressive cello solo. This is an interesting album, dependent on merging several artists beneath a colorful umbrella of Andy Milne’s creativity. This is his novel approach to composing and merging a group awareness, epitomizing a democratic approach to collective music, adding prose mixed with instrumental freedom, wrapped in emotional deliveries. However, I still don’t know why there are dogs on the cover.